This message is for website owners – who want links to their websites. We are actively attempting to grow our number of visitors – and who isn’t these days. We’ll keep it short – we’re open to exchanging links – so please fill out the contact us section of the site and let us know about your web page. We’re open to just about anything – aside from adult content – we’re not interested, thanks anyway! So if you add a link to out site and send us the URL where it is, we’ll add a link back to your site at the next update! One quick note about the shop – we know that many of the items listed are sold out – we still have thousands of boxes – so please dig through the listings while we figure out a way to hide the items that are currently out of stock. Thanks for visiting and keep in touch – and please make sure to follow us on Facebook to get the latest updates! 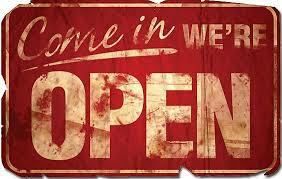 We are open again – thanks for your patience with us during our international travel. We invite you to browse our growing selection of quality cigar boxes – we also encourage you to contact us with inquiries of all types with regards to quality, used cigar boxes – as always. 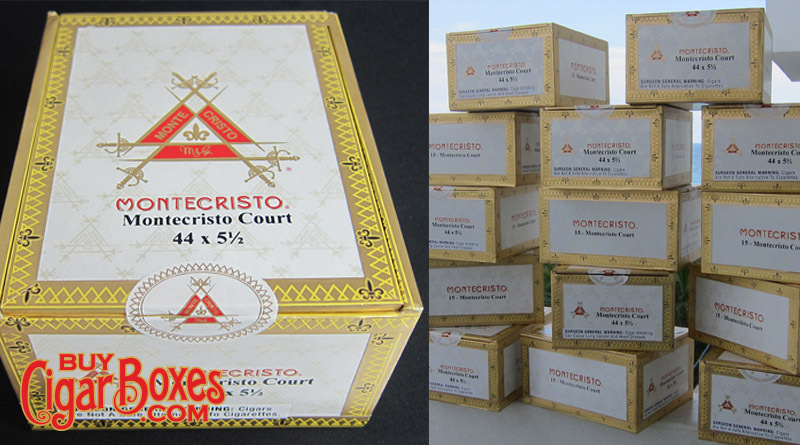 We specialize in providing cigar boxes in large quantities for all purposes including window-dressing, specialty shipping boxes and containers and more. Thanks for shopping! I started out smoking cigarettes like most other people did probably – first a few cigarettes outside my high school with other kids. At some point around the age of 16, I got a job a convenience store and that certainly gave me the opportunity to try most brands of cigarettes available. By the end of high school, I was most likely almost smoking a pack a day. Cut to college – I couldn’t wait to be on my own, one of the reasons being that I could smoke whenever and where ever I pleased. From that point on, I was definitely smoking a full pack a day – or more, if I was ‘partying’. Without wasting much time on this topic, 17 years later at 40 years of age, I was smoking two packs of cigarettes a day – without fail. I had a terrible co ugh and continued to smoke, even though I could feel the effects of smoking and they scared me. I was literally afraid that I could suffer a heart attack at any minute. In November of 2012, I started to have a problem with my Sciatic nerve that only surgery could cure. I am very much simplifying this story so that I get to the point here… Upon learning that three rounds of Epidural injections didn’t work – I signed up to have surgery for a slipped disc. After suffering for months, (and continuing to smoke cigarettes heavily), I discussed the process and surgery with a friend who is also a Doctor. He told me that I had to quit smoking in order to heal properly. I decided then, that I needed to quit. I had tried to quit smoking unsuccessfully on about three other occasions, the most successful attempt lasting about three months when I was in my 20’s. 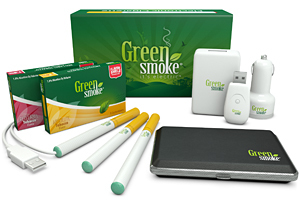 Only July 20th, I received my GreenSmoke Pro Kit and on July 21st, I vowed to give it a serious shot and to throw away my analog cigarettes and switch to ‘vaping’ – smoking only the vaporized nicotiene cigarettes from GreenSmoke. Since I started using the e-cigs, I haven’t smoked a single cigarette – NOT EVEN ONE. Of course this took some will-power, but it’s been the easiest time that I’ve ever had quitting smoking. One of the things I quickly realized is that I don’t stink like cigarettes anymore and can’t even stand the smell of them anymore. The Greensmoke ecigs don’t smell and what you’re exhaling is basically just vapor. I even (smoked), “vaped” them in the hospital during my recovery. This probably should have been kept secret, but it’s true. Today, I have been smoke free for 101 (ONE HUNDRED AND ONE DAYS) – the best part of this is that this time, I KNOW FOR CERTAIN, that I’m never going to smoke again. Ordinarily, I would never post information like this to one of my websites, but I feel so strongly in favor of this product and what it’s done for my life that I wanted to share this information in any way I can. I know that many others are joining in switching from analog cigarettes to ecigs – and this is just one brand – it’s the brand of ecig that I use and recommend, there are thousands of other ways and also online communities dedicated to helping others quit smoking, the electonic_cigarette subreddit is one of them, you can check it out here. I strongly suggest that you check out and purchase their products and STOP SMOKING CIGARETTES as fast as you can. This also makes an incredible, possibly life-changing gift for a loved one. Click this link to check out the GreenSmoke website and I wish you the best of luck. If you have any questions about this article, please write in the comments and I will do my best to respond to them. Please reach out to me if this article helps you or a loved one quit smoking – I’d really love to hear about it! 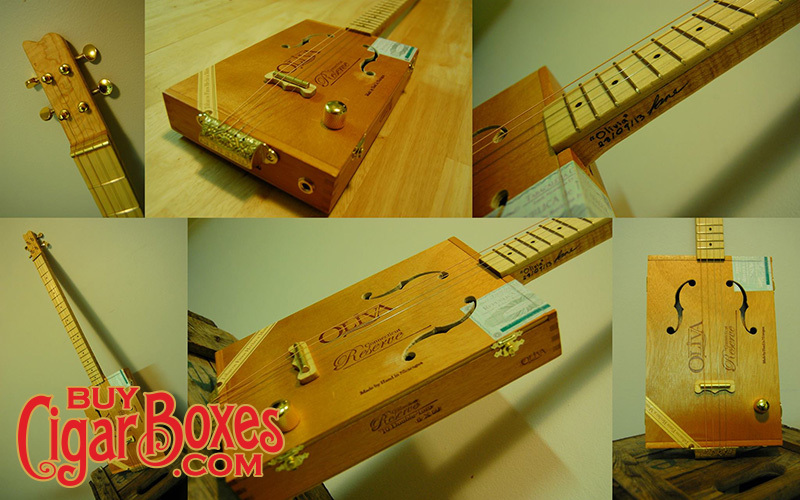 Great pictures of a 4 string electric cigar box guitar created by one of our customers L. Anderson. Very nice looking! 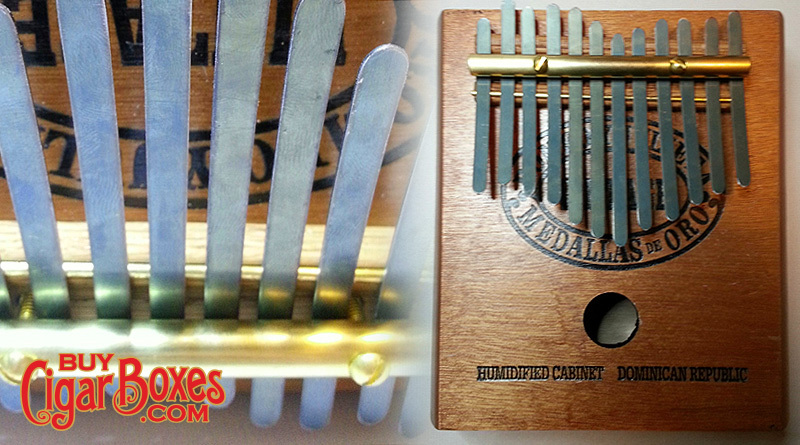 This Cigar Box Kalimba is made from what I believe to be Spanish Cedar – as most find cigar boxes are. Cedrela odorata is a very important timber tree, producing a lightweight fragrant wood with very good resistance to termites and other wood-boring insects, and also rot-resistant outdoors. The wood is often sold under the name “Spanish-cedar” (like many trade names, confusing as it is neither Spanish nor a cedar), and is the traditional wood used for making cigar boxes, as well as being used for general outdoor and construction work, paneling and veneer wood. It is also the standard wood used for the neck of “classical”-style guitars, as well as for the linings of the guitar (tiny blocks of wood that attach the top and bottom of the guitar to the sides). It has a decent tone – I might make the hole larger – if that will make the sound louder (anyone know about this?). In honesty, I’ve spent at least one full hour tuning it and it’s still not exactly right – once I get it there, I’ll post a video with sound! If this isn’t a labor of love, I don’t know what is. The kalimba is played by holding the instrument in the hands and plucking the tines with the thumbs. More news on this coming soon – will try and post a video with audio so you can hear the sound. We are considering offering a kit like this – please sound off and let us know if you’d be interested in purchasing a Kalimba Kit! 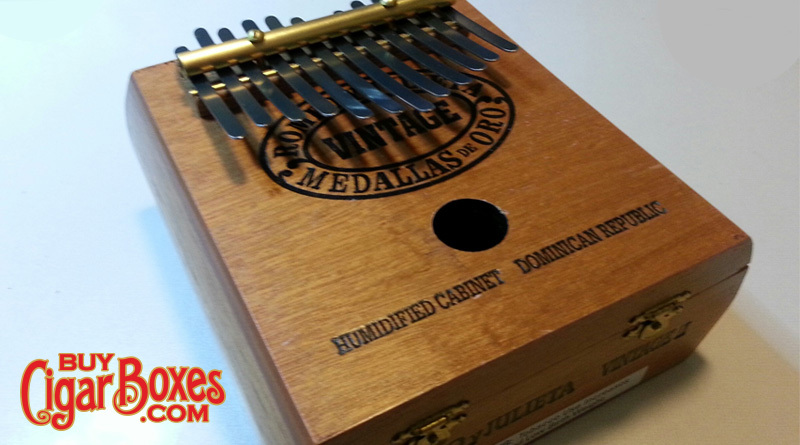 In the meantime, check out our serious selection of empty cigar boxes – perfect for making Kalimbas, Ukulele’s, Guitars . . . purses . . . lamps . . . birdhouses . . and tons of other things! I can guarantee that it will NOT sound anywhere near as nice as this one does. This guy has got serious skills, I definitely could never wear that hat either. 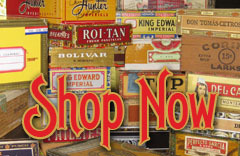 I am in the process of adding over 200 wooden cigar boxes to our store – the problem is – there’s just too many of them! So, I have made the (unfortunate,) decision that there’s just not enough time to measure each box. So here’s the deal – if you want to know the measurements on any box in particular, just email us or use the contact form. Please make sure and use the entire title of the box you are interested in, as many of them have very similar names. I have just added about 65 boxes and I’m tired – but I might try to add the rest – and definitely will add them in the next day or so, so please keep checking back for more. 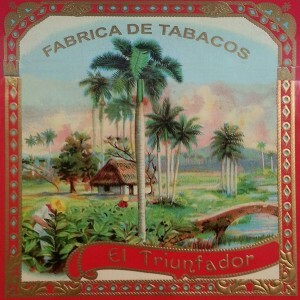 This “El Triunfador” Cigar Box is not one of the beefiest boxes we’ve seen – in fact it’s kind of weak feeling, soft maybe . . . “light construction”, might be a good way to describe it. It’s been sitting near my desk for a while though, because the labels on box are particularly interesting and beautiful. So much so, that I decided to take a picture of the side art, which wraps to the top of the box and isn’t put on straight. I did a quick Photoshop job on it to make it one piece and I really wish that this box was in perfect condition – alas, such is the way with used, empty cigar boxes. Anyway, pictured here is the art – I think you’ll like it and I wish I knew more about it, but seeing it is pretty cool. We will be adding a lot of new boxes soon, so please bookmark us and check back in a few weeks. We’re going to add hundreds of new boxes of all sizes and varieties and you won’t want to miss them! Sign up to our mailing list on the right and you’ll get advance notice and first crack at the new inventory when we go live with it! 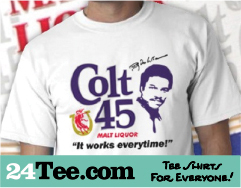 24tee.com stocks a HUGE variety of hip, hot, cool and fresh apparel – We invite you to check out our fabulous selection of comfortable, high quality tee shirts for men and women – we’ve got thousands of customers that LOVE them! Our newest arrivals, BABY ONESIES make great gifts for newborns. We are going out now to stock up on more boxes – as we were posting the latest additions, they are disappearing as fast as we are able to add them. The truth is – cataloging each box has become tedious and we will most likely be pairing new arrivals into sets that cannot be broken up. This will help us be more efficient and bring more products to market. We thank all of our customers for shopping with buycigarboxes.com and hope that you’ll return. It’s hard to deal with the shipping rates but we have no choice. We hope you’ll understand this is largely a labor of love also. 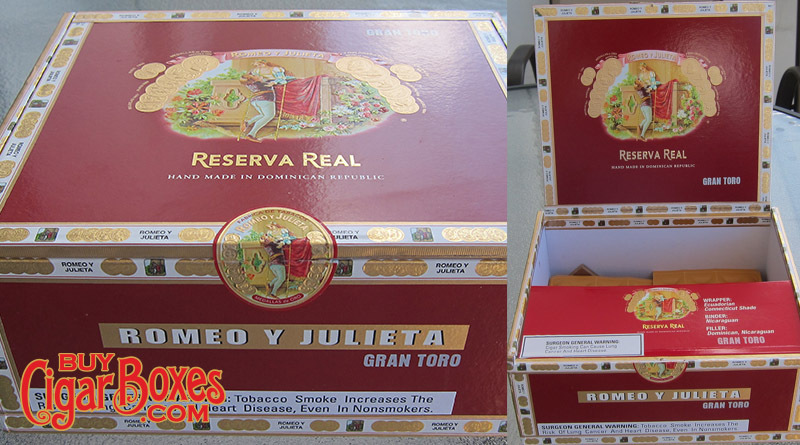 Set of 9 Romero y Julieta Gran Toro Red Boxes in Great Condition dimensions: 8.2" x 6.8" x 3.6"
Set of 14 Montecristo Court Wooden Cigar Boxes Individual Box dimensions: 5.2" x 6.35" x 3.55"
Please look for new additions very soon!